I've put up an article on Albarracin, Spain's own Fontainebleau. Also check out the Albarracin photo gallery! Fontainebleau is a small town situated just south of Paris (65 km). It has an illustrious history and was home to many French royals during the past centuries. Centrepiece of the town is the château, with its modern day look formed by Napoleon Bonaparte during his rule. For climbers, this quaint village would be rather uninteresting if it didn’t have one of the worlds finest bouldering areas! 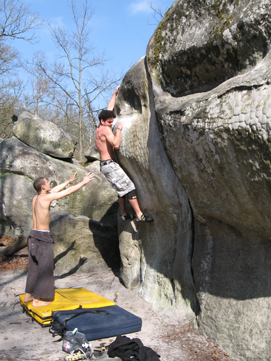 Font is home to some of the most famous boulder problems in the world, and the French bouldering tradition here dates back to the ´50s. In fact, many of the local heroes can be seen doing the “parcours,” colour coded circuits which are a symbol of bouldering in this area. Probably the best aspect of this area is its accessibility. You don’t have to drive dodgy roads, or hike up any mountains to get here. Just park your car at the nearest forest parking space, and you’ll be in within 10 minutes of numerous boulder problems. Because of its popularity you’ll find tons of climbers from all over the world coming to visit Font, and if you’re lucky you might catch a top climber or two blasting away some truly mean stuff. Bleau’s boulder areas are divided into sectors, each self contained with its own specific routes. 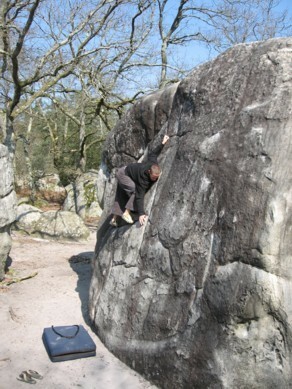 In these sectors one can either pick out boulders to work on or try completing the aforementioned “parcours”. These circuits are colour coded, and consist of boulders with roughly the same difficulty. But just because some circuits are graded as easy doesn’t mean they won’t be a challenge. Doing over fifty 5b problems in a day will get you pumping for sure! For anyone new to Font, the circuit method is probably the best way to get a feel for the area. It’s also good fun with a couple of friends. Everyone’s got their own strengths and weaknesses, and it will show during a circuit. As mentioned above the sectors offer a staggering amount of problems and you’ll definitely want to pick up one of the numerous guide books out there. The tourist information in town sells a number of them, and they come in a couple of different languages. Some of the sectors are not that easy to find, and as such you might want to pick up detailed map of the forest as well. Bleau's biggest draw is the volume and variety of rock that you will find. I’ve been to this forest on four different occasions and I haven’t even seen half of what it has to offer. There is truly something here for every type of climber. A typical sector might offer upwards of 100+ problems to work on. Slopers, crimps, slabs, big dynamos, highballs, massive roofs; you name it and it’s probably here. Unfortunately many boulders are very polished, especially those in the more famous sectors. A lot of foot grips are black from resin and provide minimal grip, if at all. Bleau also requires that you learn some good spotting techniques. 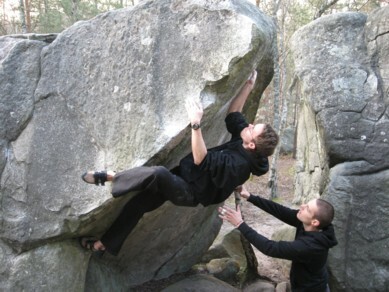 Bring a crash pad or two, since you will be flying hard off some boulders, and they do get quite high! Chalking is allowed but should still be done discreetly. There are always a lot of climbers in the forest, especially during the holiday seasons. On the one hand this can bring about a nice sense of community, but on the other it can be a bit annoying with some of the more famous boulders being projected for the whole day.